MONARAGALA: The Wanniyela Aththo population in Monaragala has become the latest target for religious conversion at the hands of Christian fundamentalists lurking behind poverty-stricken victims to spread their faith. Veddah Chief Danigala Mahabandralage Sudubande Randunu Wanniyela Attho of the Ratugala community, told The Daily News that the situation has upset the normal way of life in the community with people in the community becoming excessively dependent on the economic support of these people. Twelve out of 60 families in the village have already surrendered themselves to funds offered by them and accepted their Agam pojja (religious faith) in return, he said. Explaining the situation Wanniyala Attho said: "They visit our villages mostly as non-Governmental organisations. They promise things like jobs, better houses, food, education and other things to our people and take them away to teach the English language." Most victims had been taken away to several places in Negombo to convert them, he said. Asked to explain the situation with regard to these conversions, Ven. 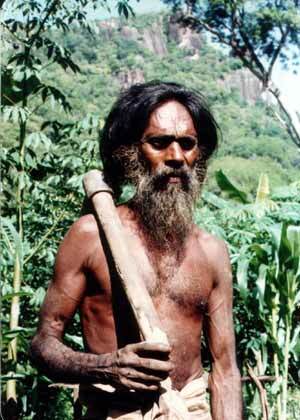 Mawasagolle Pannarathana Thera, a teacher of Galkumubure Pirivena situated close to Rathugala village said that the Veddah community was a traditional Buddhist community as is apparent from their birth certificates. "They are a poor community and the level of education is very low . This is the very reason they fall prey to these religious forces," said the Ven. Thera. "The temple can hardly provide for them with its scarce resources for the temple is also dependent on laymen," he added. Secretary of Religious Affairs Ministry, B.M. Jinasena said the Ministry was aware of the situation in Rathugala but it was unable to take any comprehensive strides to address the situation. "However, once the legislation is passed we are planning to step up action to address the situation," he said. The Anti Conversion Bill proposed by Jathika Hela Urumaya with the aim of empowering State institutions to address this sort of situation, is yet to be approved in Parliament. The Supreme Court has introduced several amendments to the Bill while removing certain provisions, Jathika Hela Urumaya sources said.